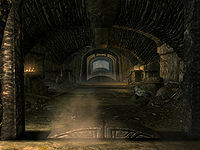 Reachwater Rock is a small cave east-southeast of Markarth and south of Sky Haven Temple, containing draugr. Reachwater Rock is home to the crypt of Archmage Gauldur. It cannot be fully explored unless you are well on your way to finishing the related quest; it can be started here, but you still don't get access without leaving the cave first. It has only one zone: Reachwater Rock. 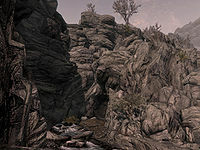 The path to Reachwater Rock is on your right just before crossing the last bridge, on the road towards Falkreath heading southeast, before you reach the turning for Karthspire camp. One silver ore vein is located to the right of the path before reaching the stream. The path ends at a stream that is falling from the mountains above; the entrance is through the waterfall. One iron ore vein is located on the opposite side of the stream where the path ends. Upon entering this natural cavern you will have a waterfall on your right, with the stream heading north-south into the cavern. There are many mushroom ingredients growing in this first room and throughout the ruin; see the table below for the totals. The stream drops into a pool of water with an adept locked chest and a skeleton with a random shield and a random greatsword at the bottom. The path winds around the pool to the left; on your left is a lit brazier with an orichalcum ore vein next to it. The path continues over a rock bridge to an island in the middle. There is a dead adventurer next to a tree. To the left is a plinth holding the emerald dragon claw, which is needed for the door in this chamber across the bridge. Underneath the claw is an Ancient Edict which continues the lore for the related quest and warns you to not to continue. Looking east from the puzzle door you will see on the far side of the cavern, above the ore vein a ledge containing an unlocked chest. This can be reached by using Whirlwind Sprint. With only one word, you will need to stand on top of the claw-like piece of broken statue near the juniper tree and move forward or jump after shouting until you scramble onto the ledge. With two or three words, the ledge is more readily accessible. Continue over a second rock bridge up to a puzzle door. Examine the underside of the emerald dragon claw in your inventory menu for the correct combination, Bear—Whale—Snake. Upon opening the door, you will see that it in fact opens a series of four similar doors in a row. Follow the corridor over the now open four doors to a second puzzle door. This one is opened using the ivory dragon claw found in Folgunthur during the quest, and the correct combination is Hawk—Hawk—Dragon. This door is protected by a poisoned dart trap which shoots from either side after incorrect combinations. This door opens at the top of a flight of stairs, with a bench on your left and a burial urn on your right. At the bottom of the stairs are four lit braziers; behind the back right-hand one is a random potion of healing and behind the back left-hand one a burial urn. To the south is a large urn. The path continues to the north into a large room with a total of eight upright sarcophagi around the room on different levels. 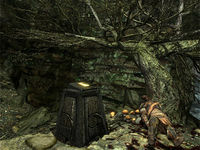 At the northern end of the room is a stone table where you place the three parts of the Gauldur Amulet during the related quest. Behind this is a ninth sarcophagus which contain the remains of Archmage Gauldur; once you have completed the quest make sure you search his remains for a large amount of septims. 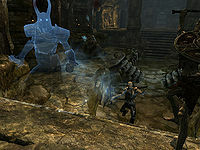 All of the upright sarcophagi's inhabitants can be dealt with prior to placing the amulet parts utilizing a rune spell. On your way back out of this room after the end of the quest, you will see that next to the large urn to the south a doorway has opened in the wall revealing a boss chest with a random helmet, sword, shield, battleaxe and filled soul gem, as well as a large coin purse. The dead adventurer in the first chamber has a copy of Lost Legends in their inventory. The claw may not show up in your inventory after picking it up but can still be used on doors. ? Use the console command player.additem ed417 1 to add it to your inventory. Sigdis Gauldurson may use Unrelenting Force and knock you past the barrier separating you from the ghosts, glitching you to the point where you must reload a save. It may be possible to use ranged shouts or magic to kill the ghosts and lift the barrier, or you can conjure a creature on the other side of the barrier (if combat stops after conjuring, use hostile magic to start it again). You can use the console command tcl to pass through the barrier. It may be necessary to load a previous save to fix this. The ghost may not come down for you to fight him, instead just standing and staring at the wall. In the pool of water in the main chamber, there are several "holes" in the water where you can breathe and walk normally. The most noticeable one is at the deepest part of the pool. The emerald dragon claw may not spawn. ? Load an old save to fix this or simply walk out of the cave and re-enter. If Dawnbreaker is used to destroy one of the ghosts and its ability activates, the ghost may not return to the shelf and the next one will not come down to fight. This page was last modified on 17 December 2017, at 21:21.